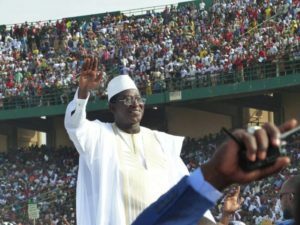 Mali’s opposition leader Soumaïla Cissé was sworn in on Saturday as a candidate for the July 29 presidential election by thousands of his supporters in a stadium in capital Bamako. The former minister of finance who lost against the current president, Ibrahim Boubacar Keita in 2013, warned against fraud in upcoming polls. “Let us be vigilant, no cheating, no fraud as in 2013… we will no longer accept that,” he said. Cissé, 68, twice stood unsuccessfully as a presidential candidate, in 2002 and 2013. On both occasions, he was defeated in a second round of voting. Since 2014, he is at the head of the Union for the Republic and Democracy party. The Malian government has for months said the presidential election will take place as planned, despite successive postponements due to threats by jihadists. Incumbent President Ibrahim Boubacar Keïta has not yet declared his intention to seek a second term but is widely expected to do so after a coalition of nearly 70 parties, last month, said he is the trusted candidate for the impending presidential election. . The country is still a theater of unrest almost six years after a French-led military operation chased Islamic extremists linked to Al-Qaeda from Northern areas they had taken control of in early 2012. Mali’s army, French soldiers and a UN mission (MINUSMA) still have little control over large tracts of the country, which regularly come under attack. Posted by Geraldine Boechat on May 14, 2018. Filed under Zoom. You can follow any responses to this entry through the RSS 2.0. Both comments and pings are currently closed.